From the ocean depths to river rapids, fascinating aquatic life can be found in all climates and settings. 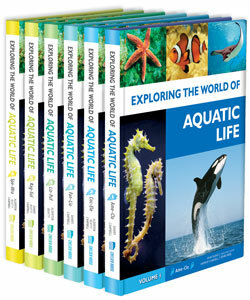 Geared toward young students, the six-volume Exploring the World of Aquatic Life set is packed with information, naturalistic artwork, helpful maps, and stunning full-color photography intended to illustrate key life-science principles while providing thorough information on the fish, mammals, and invertebrates that live a largely aquatic life. Each volume looks at the natural history of aquatic life-forms, arranged in alphabetical order. In addition to discovering the many ways in which particular types of creatures hunt, feed, breed, and defend themselves, young readers will also learn about topics such as adaptation, ecology, genetics, communication, conservation, endangered species, and habitats. “Did You Know?” sidebars presenting interesting and little-known facts. This colorful, engaging set makes a fine companion to Exploring the World of Mammals and Exploring the World of Reptiles and Amphibians, and is sure to captivate young readers with its exciting descriptions of life in the Earth’s oceans, seas, and other bodies of water. Full-color photographs and illustrations. Maps. Appendixes. Fact boxes. Sidebars. Glossary. Index. Consultant editor John P. Friel, Ph.D., is the Curator of Fishes, Amphibians, and Reptiles at the Cornell University Museum of Vertebrates, an internationally recognized institution dedicated to the study of vertebrates. His main research interest is working with catfish. He has also actively collected freshwater fish in several African countries. David Alderton has written many articles and books about fish and aquatic life. He has had a keen interest in this area for many years, both as a fish-keeper, observing and breeding a variety of species in aquaria, and from growing up by the sea in Brighton, England. Andrew Campbell has held a lifelong interest in aquatic invertebrates. He studied zoology at St. Andrews and Oxford universities and has taught much of his life at Queen Mary, University of London. His research activities have centered on marine invertebrates, coral reef biology and marine conservation, especially of turtles. Campbell is a regular contributor to radio and television programming on matters concerning marine life and has numerous scientific publications to his name. Richard Beatty grew up on the east coast of Scotland, where he became fascinated by the region’s varied marine life. After studying zoology at Cambridge University, he pursued a career as a science and natural history editor and writer. Beatty has written a dozen books and many encyclopedia articles on science and natural history, mainly for children. John Dawes has been keeping ornamental fish and cultivating aquatic plants for around 55 years. He has written more than 4,000 articles and has contributed to more than 30 books as author, editor, and editorial consultant. Now a freelance author and consultant, Dawes currently writes for trade publications and is the chief editor of Aquarama Magazine, a Singapore-based trade publication. "The layout is bright and appealing...With its large typeface, clear explanations, and open layout, this set will appeal to younger students and would be a useful addition to school and public libraries." "With its colorful photos, pleasant drawings, and plentiful sidebars, this exploration of numerous freshwater and marine creatures is attractive." "Twenty Best Bets for Student Researchers, 2009"